Maame Biney has a lot on her mind right now. Having just turned 18, she is thinking about her high school graduation in June. She is wondering if anyone will ask her to prom. She has taken her ACTs and her SATs and she is applying to six colleges, including the University of Utah. “Hopefully, they accept me,” she says and giggles. Her extracurriculars might help there. After all, few things can spruce up a college application like an Olympic medal. And if Biney needs any help with her personal essays, every major media outlet in the nation is about to take a crack at telling her story. 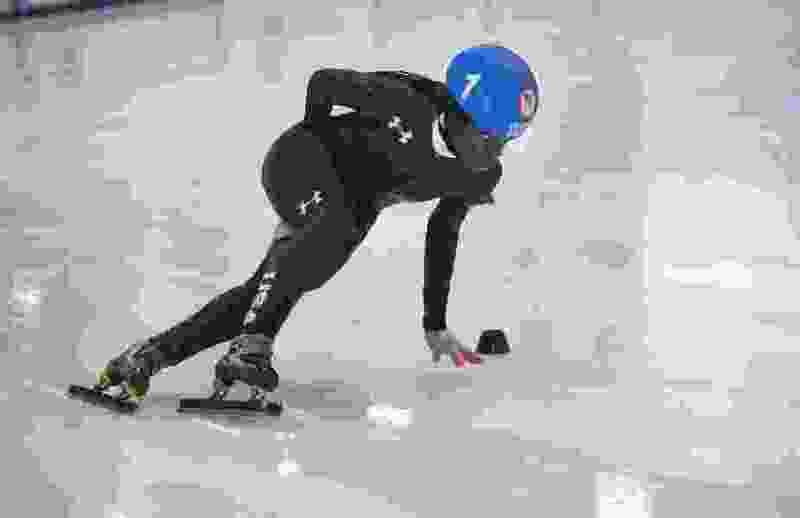 It is a journey that has taken her from Ghana, to Virginia, to Park City, and now to Pyeongchang, South Korea, where she will be the first African-American woman to ever race for the U.S. Olympic speedskating team, a medal contender, a central figure in NBC’s coverage of the Winter Games, and the vivacious teenager who seems to leave an impression on everyone she meets. Biney’s path to the Olympics started when she was 5 years old. When Kweku Biney came to the United States looking for work, his young daughter was supposed to stay with him only for a few weeks before returning home to Ghana. One day during their stay, Kweku took Maame to a J.C. Penney. The Bineys stayed there in Reston, Va., where Kweku would later see a sign for a children’s figure skating lesson. He signed up his daughter but was later told she might be better off doing something else on the ice. (Scott Sommerdorf | The Salt Lake Tribune) Kweku Biney, father of Maame Biney, cheers for her as she is introduced prior to her 1000 meter finals race during day 3 of the U.S. short-track Olympic Team Trials at the Utah Olympic Oval, Sunday, December 17, 2017. Biney made the US Olympic team. This girl skates too fast, one of the instructors told her father. For the next 10 years, Maame raced with the Washington, D.C., area club Dominion until she was too fast for the other skaters there, too. Without older, stronger skaters to push her, Maame wouldn’t reach her full potential or her goal of making the Olympic team. So last year, Maame told her father that she needed to move to Utah, where she could train full time with the U.S. short-track team. Kweku was resistant to let his daughter leave his side, and he might not have relented if he had never met Melissa Sorenson, of Park City. A few years earlier, Sorenson had taken her daughter, Abigail, to Virginia to spend some time training with the Dominion team. Last July, Maame moved from Virginia to Park City. On the ice, the decision to come to Utah has paid off. Her time in the 500-meter race was about 44.1 seconds when she arrived in Utah. She has shaved more than a full second off that in the seven months since. She has set personal bests in each competition she has skated in recent months. Off the ice, things have been just as good for the teenager. She has hiked through the Wasatch Mountains, attended a showing of “Book of Mormon” musical in Salt Lake City, and, she says, gained another family. She considers Abigail her sister and Melissa Sorenson a mother now. “I have multiple moms,” Maame says. The skater has not seen her mother in Ghana since 2014. Maame talks to her on the phone frequently, though she sometimes wonders if her mom really appreciates the sport to which she has devoted her life. Biney is young, a gummy bear-addicted teenager who punctuates nearly every sentence with a giggle. But she is aware of the history she is making at these Olympics, still feels a strong connection to the country where she was born, and so she gets more serious when she is asked about President Donald Trump’s reported remarks regarding African immigrants. Maame’s message — on and off the ice — is always one of joy. 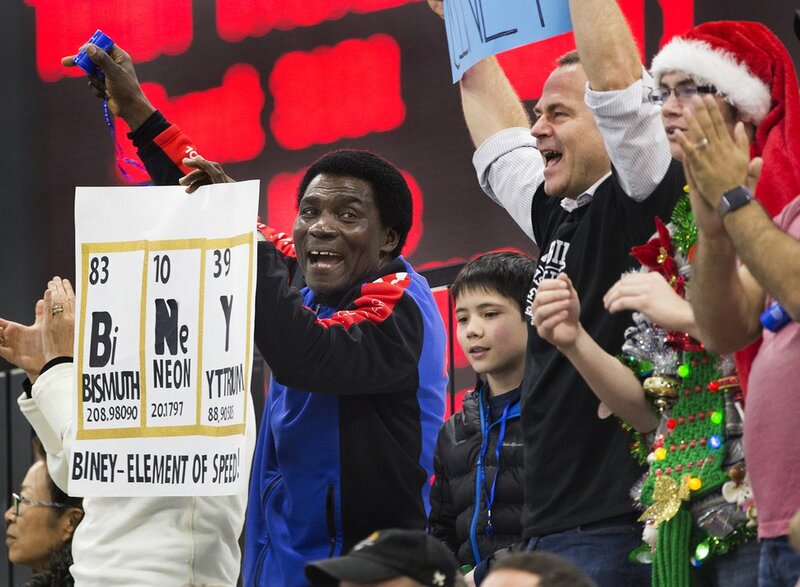 With Maame’s place on the U.S. Olympic team on the line last December, Sorenson and her family held signs and shouted from the bleachers at the Utah Olympic Oval in Kearns. Kweku, with noisemakers in each hand, yelled louder still. There were also others in her cheering section, strangers, people who had only brushes with Maame but still felt drawn to her because of an act of kindness she had shown them or the way she’d carried herself in front of their children at a skating event. Maame jumped out to a start so fast, sprinted to a lead so big, that none of her teammates ever had a chance to catch her. And after Maame had crossed the finish line, she celebrated with such fist-pumping, braid-shaking, unbridled joy that she fell on the ice. As she sat there, she tried but failed to hide her smile with her hands. In her first trip to the Olympics, Maame says she isn’t putting pressure on herself to medal. And Maame is ready to show the world how much fun she can have.